In the 1910s people flocked to Hollywood, CA to find fame, fortune and success. It was similar to the 1840s Gold Rush when people from all over streamed into San Francisco to get rich panning for gold. 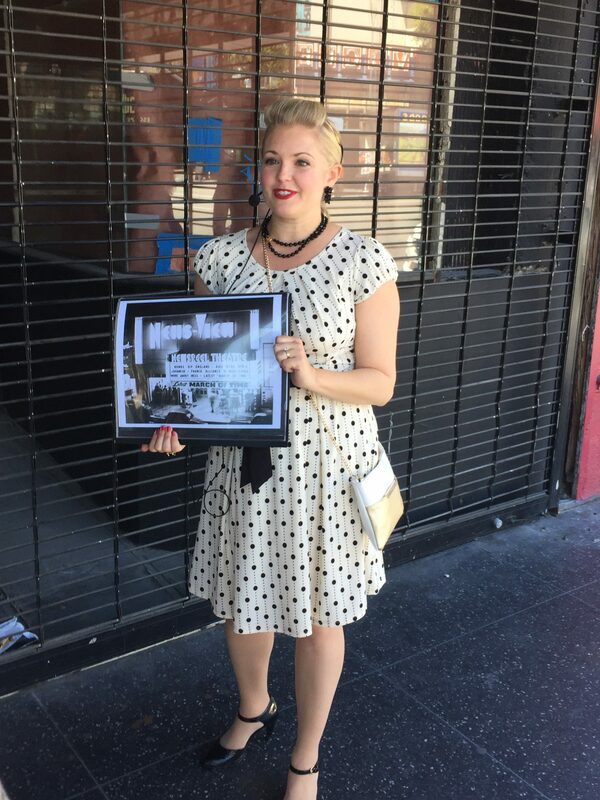 “Unfortunately, there were too many people coming into Hollywood and not enough movies being made to accommodate all the people,” said our stylish tour guide April Brooks Clemmer, while enjoying an Old Hollywood Walking Tour. Continuing on our tour, we learned that in 1910 the silent film – Love Among the Roses was filmed in Paul de Longpre’s garden by a new director D.W. Griffith, and a 15 year old actress named Mary Pickford. More films were made in Hollywood, California. 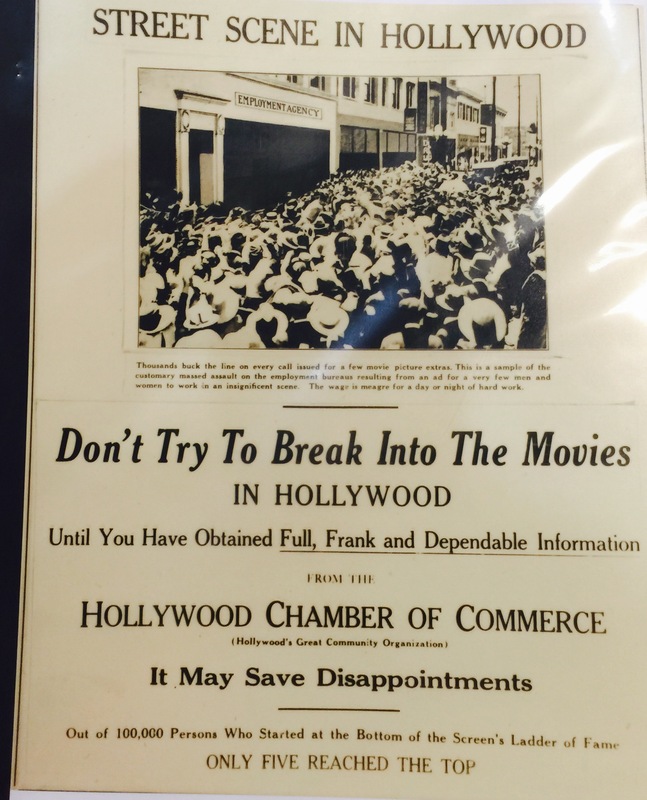 “In 1931 the Hollywood Chamber of Commerce created a notice stating – Don’t Try To Break Into The Movies in Hollywood…..It May Save Disappointments,” Clemmer told a group of 12 locals and tourist following her on a 1.8 miles gentle walk on Hollywood Blvd. “This street was originally called Prospect Avenue. With a photo album in her hand, she showed us a photo of signs posted on the windows of apartments and housing stating “No Dogs, No Actors allowed.” Pointing towards the Hillview Apartments, we discovered that in 1917, movie moguls Jesse L. Lasky, co-founder of Paramount Pictures, and his brother-in-law Samuel Goldwyn, co-founder of Metro-Goldwyn-Mayer, built this apartment building for their actors, since housing was scarce. Rudolph Valentino, Stan Laurel, Charlie Chaplin and Clara Bow lived here. Today the Hillview’s neon sign is still on the corner of the beautifully restored building, however it’s now known as The Hudson, still attracting creative types. Nearby is the oldest remaining home on Hollywood Blvd. known as Janes House. Located in the back of Janes Square, it’s a two-story Queen Anne home built in 1903 with shingled gables and turrets. Beginning in 1911, Janes House was a family-run school, attracting the children of early Hollywood celebrities such as Charlie Chaplin, Douglas Fairbanks, Cecil B. DeMille, and Jesse Lasky. Mary Ruth Janes and her three daughters ran the well-respected school and lived in the home until 1982. “Now it’s a secret nightclub named – No Vacancy,” Clemmer said. She showed us an old photo before Albert, the owner of the next door Secret Restaurant, invited us inside to see his framed illustration of the property. We walked to several movie theaters that included the Fox Theatre built in 1918 as the first movie theatre. 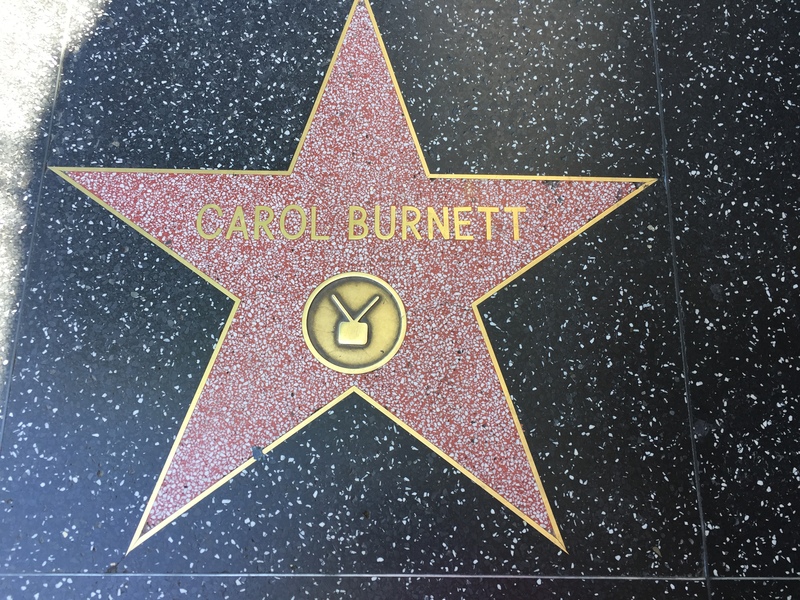 Along the way we admired the Walk of Fame stars on the pedestrian walkway. Clemmer shared with us that Alfred Hitchcock’s star was installed in front of the Fox Theatre in 1960 at the premiere of his movie Psycho. Hollywood offered the most glamorous shopping district in the 1920s with J.P. Newberry and the Kress Building, on the corner of Whitley and Hollywood Blvd. “Gloria Swanson bought perfume at the Kress Building,” Climber told us. 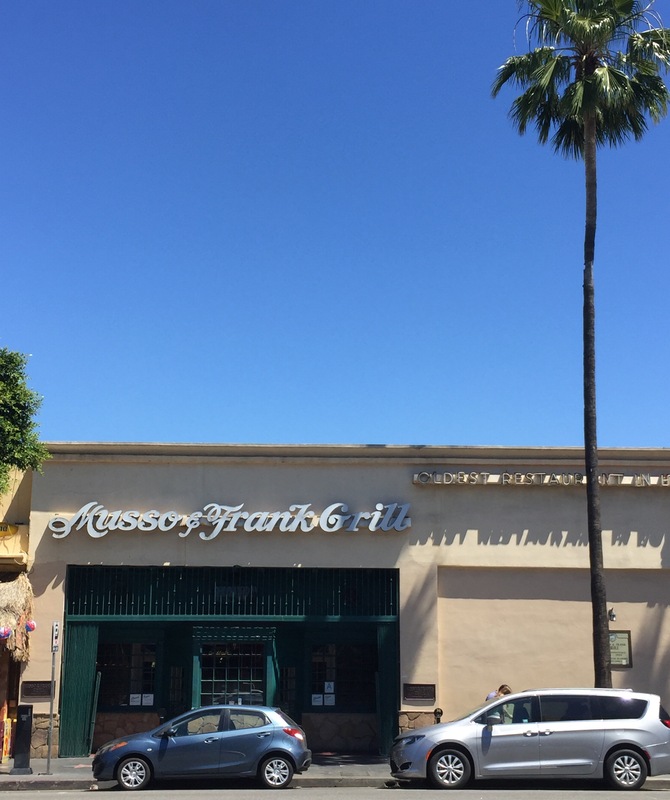 The tour ends at one of the most famous restaurant’s in Hollywood, Musso and Frank Grill. 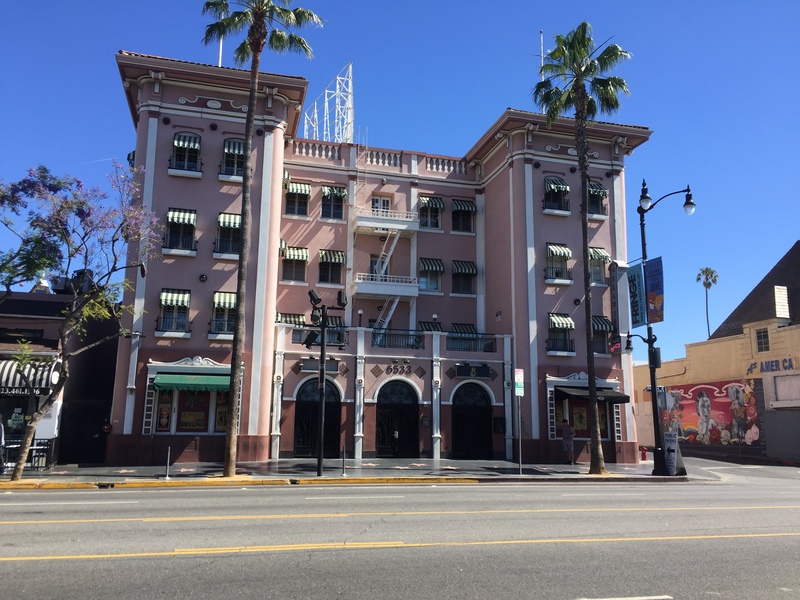 Built in 1919, it became the go-to dining spot for Mary Pickford, Rudolph Valentino, Douglas Fairbanks, and Charlie Chaplin. Greta Garbo and Gary Cooper dined here, while Humphrey Bogart sipped martinis at the bar with Dashielle Hammett or Lauren Bacall. In the ‘50s, Hollywood legend Marilyn Monroe while married to Joe DiMaggio, had her own booth. Elizabeth Taylor and Steve McQueen enjoyed meals and cocktails in Musso’s famous Back Room. “Ernest Hemingway mixed his own mint julep,” said Clemmer. “It was a big writers hangout. Fitzgerald proofed his works here.” Clemmer shared with us that the waiters will only tell stories about actors who have died, but will never talk about those who are alive, to protect their privacy. 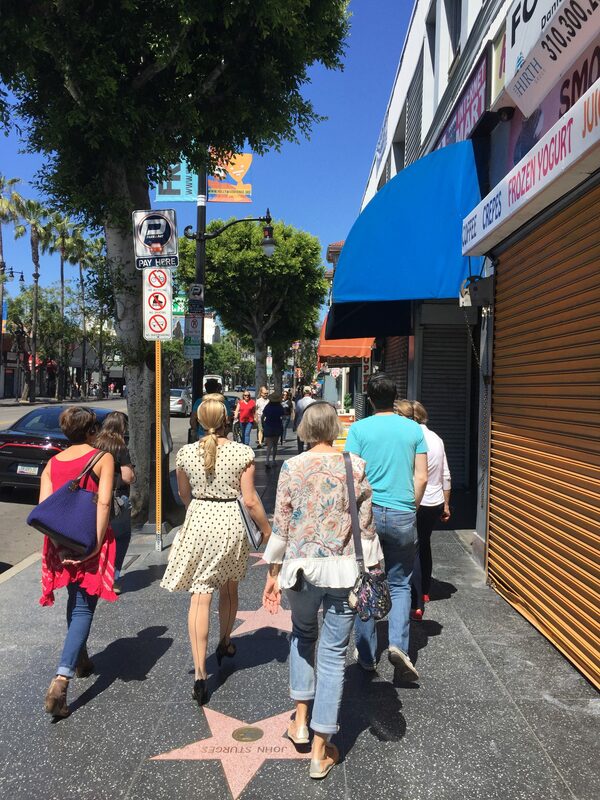 Learn how Hollywood is a vibrant walkable community that strives to return to it’s glamorous glory days. The two hour detailed tour starts on the last Friday of every month at 10 a.m. There is a special Saturday, June 17 tour at 10 a.m. The tour starts at the Hollywood Property Owners Alliance office at 6562 Hollywood Blvd. Hollywood, CA.